United States Lines and the heydays of trans-Atlantic travel on the last two great American ocean liners, the S.S. America and United States. It’s hard to believe, but one of the most popular airplanes of all times started out as a reject. When Boeing President William Allen launched the 707, in 1952, he had no orders. Airline executives turned it down as an expensive gas guzzler. The flying public judged it unsafe. Boeing, now a leading manufacturer of commercial aircraft, was, in 1946, a non-entity in the business. Renowned for their bombers, the company specialized in military aircraft sales, a bad business to be in at the end of a war. While competitors Lockheed and Douglas were cashing In on the ‘peace dividend’ turning out Constellations and DC 4s, Boeing was laying off 70,000 employees in what company execs called the ‘Peace problem.” Boeing president William Allen knew the company’s survival depended on developing a revolutionary new commercial airliner, a major undertaking for a company with a 1% share of the commercial aircraft sales. 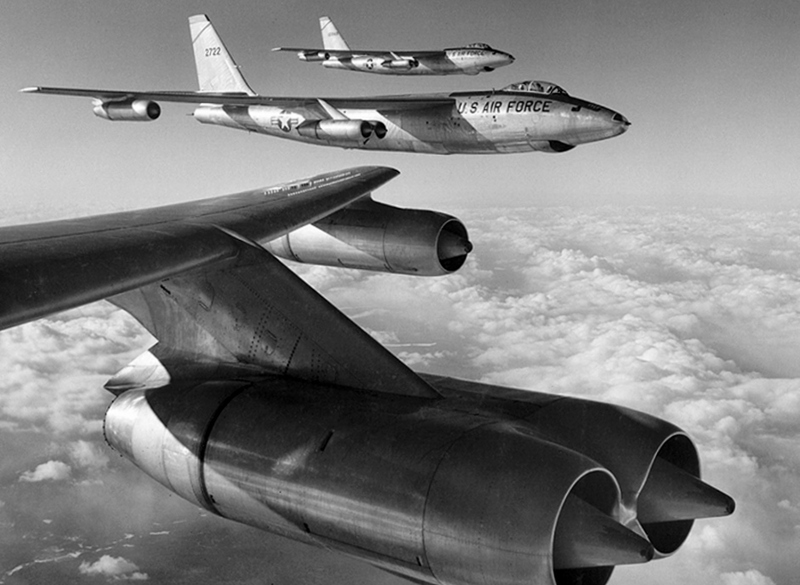 The Boeing B-47 Stratojet: Kicked off the jet age in 1947. It’s swept back wings and pod mounted jet engines were a revolution in aircraft design. Every large jet aircraft today is a descendant of the B-47. Allen found his answer in 1947, ridding in the company’s new B-47, Cruising in the stratosphere at 600 mph was a heavenly experience when compared to the slow, vibrating the DC-6 prop planes he flew on business trips to Chicago. Allen returned to Seattle with a vision for Boeing; jet flight was the future of commercial aviation and Boeing would lead the way using its bomber experience to produce a commercial jet. The B-47 with its pod mounted engines and swept back wings set the stage for the future 707. His decision was a bold move, competitors Douglas Aircraft and Lockheed, looked at the development price tag, the financial and technical risk, and shelved any serious thought of passenger jets. Boeing was on its own. Even if they were mildly interested, purchasing aircraft from Boeing required a leap of faith no one was willing to take. The company’s dismal record in commercial aircraft (Boeing had lost money on virtually all its airliners) placed the company on the bottom of the airline’s vendor list. The first test flight took place on July 15, 1954. When test pilot Tex Johnston released the breaks the plane leaped forward accelerated rapidly and was airborne by mid-runway. After a steep climb to 12,000 feet, Johnston ran a series of moves testing the plane’s controls and handling. It was a dream to fly, quiet and vibration free. 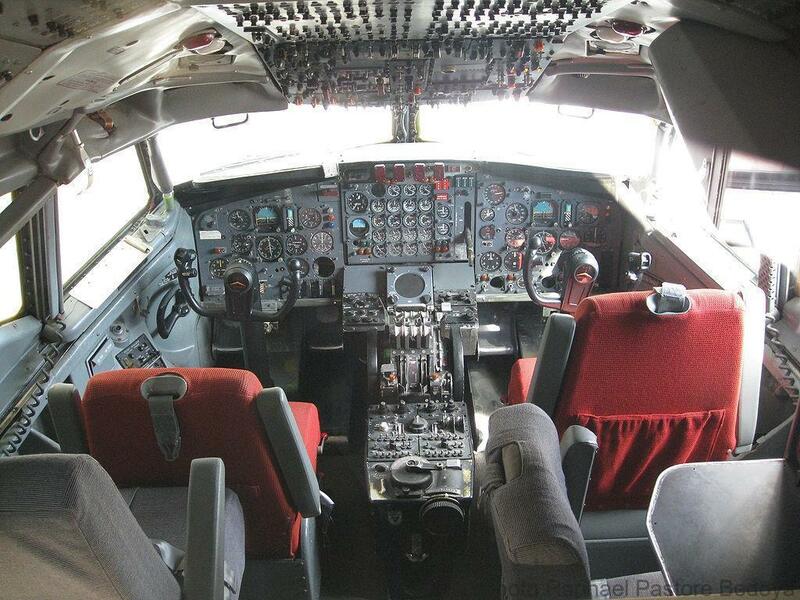 One year later, Johnston made a 707 flight that nearly cost him his job. Three years after introducing his new 707, William Allen had burned through $16 million of stockholders equity and had yet to sell one plane; his vision stood on the edge of failure. Buyers were holding back waiting for a look the soon to be released Douglas Aircraft jet powered DC 8. Allen’s opportunity to show off the 707 came on the afternoon of August 7, 1955. It was a warm sunny day with 200,000 spectators congregated on the shores of Lake Washington to watch the annual speedboat races. William Allen ordered Tex Johnston to take the plane up and give the hometown crowd a look at the new 707. On a yacht, anchored offshore, the Boeing president and his executive team were entertaining the heads of virtually every major airline in the world,in town for a conference, They came to get a good look at the plane Boeing had staked its future on. Well, they got it. Approaching the lake Johnston turned to his co-pilot, “We’re going to get their attention and make this airplane famous.” Flying towards the assembled crowd at a 490 mph, altitude 200 feet, Johnston took the big screaming jet over the race course for an for a thrilling up-close look. – Then, to everyone’s surprise, the 707 suddenly started climbing and began rotating on its axis. It’s long, swept-back wings rotating around the body in a barrel roll. Aviation executives gasped as the plane flew briefly upside down in a slow, languid roll. Just in case no one had noticed, Johnston made a shallow dive down to 300 feet and did it again. A dazed Bill Allen popped a few heart pills as he watched his $16 million dollar investment flip through the air flying upside down seemingly out of control. Either something was wrong with the plane or the pilot had lost his mind. His distress was understandable; you just don’t do that with an airliner; fighter jets perhaps but not a 128-foot-long, 160,000-pound plane with four heavy jet engines and a 130-foot wing span. The next day a seething Allen called Johnston to his office. ” What do you think you were doing yesterday.”The test pilot held his ground,” I was selling the airplane“ he told Allen, “I didn’t do anything the plane couldn’t’ do…it was never in an unsafe condition.” (100 years of Boeing Russ Banham) No doubt about it, Johnston put the 707 on the map…Or, as an aviation friend reassuringly told Bill Allen, ”Tex has just sold your plane for you.” within a month Boeing received its first order from Pan Am. Just as sales of the 707 started to take off, Douglas moved in with a slightly larger DC 8. Donald Douglas strategy was to let Boeing do the heavy lifting then move in with a better plane and steal their orders. 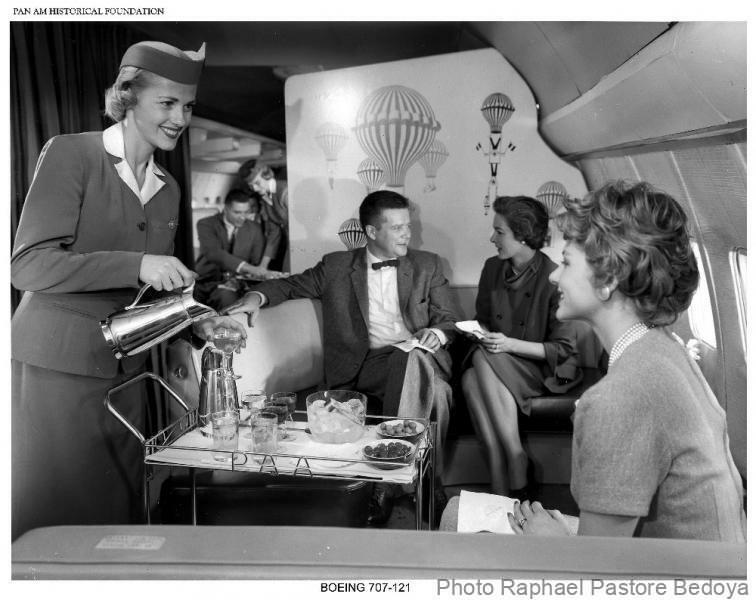 in 1955 the strategy was working, airlines were switching their orders from Boeing over to the larger DC 8. A stunned Allen, who had started the jet race, was not about to let Douglas cross the finish line first. To gain market share the Boeing president agreed to meet individual airline design demands. Need a bigger engine? We can do that; need the plane stretched, widened, short ranged, long ranged? no problem. Plane by plane Allen wore Donald Douglas and his DC-8 down. By 1956 the strategy was paying off with the 707 outselling the DC-8 by a margin of three to one. The dual was costly but Allen had the deeper pockets and outlasted Douglas. The good news, Boeing would sell over 1,010 707’s, Douglas only 556 of its DC-8 – the bad news, because of the design changes the 707 would never be particularly profitable. Bill Allen’s vision paid off. Boeing went on to become the world’s leader in the design and production of commercial jets. Under Allen’s leadership, Boeing built the 707, 727, 737, and 747–four of the most successful airliners in aviation history. It takes courage to wager a company’s future on your vision and a new technology. It takes fortitude to stay the course when all looks lost.. When asked why he took those substantial risks, Allen said, “We felt strongly that it was high time some American manufacturers took the plunge and got jet transport off of paper and into the air”(Boeing Frontiers). Allen and the employees of Boeing showed us how it’s done. William Allen, who served as the president of Boeing from 1945 to 1968, was known as a thoughtful, conservative businessman who also had the instincts and nerves of a high-stakes poker player. An understated lawyer who said he wasn’t qualified for the job, Allen transformed his company and the way we fly with his long shot bet on the Boeing 707; an accomplishment that earned him the number 2 spot on Fortune magazine’s 10 Greatest CEO’s of all time. 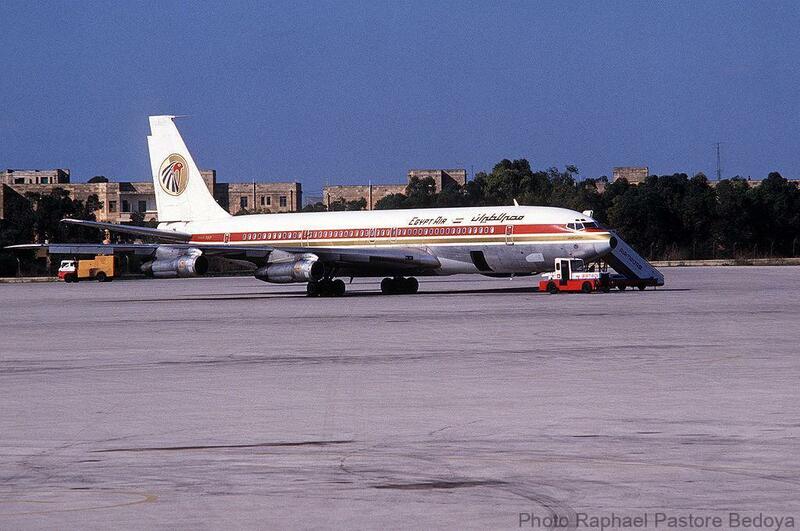 DID YOU KNOW ?That one 707 could carry as many people as the Queen Mary ocean liner sailing on an Atlantic crossing? …..How? By shuttling back and forth at jet speed in 6 and 1/2 hours from New York to Europe. From the leading edge of the wing to the cockpit bulkhead engine the pounding of engine cylinders and whirling props mercilessly pounded passenger eardrums. 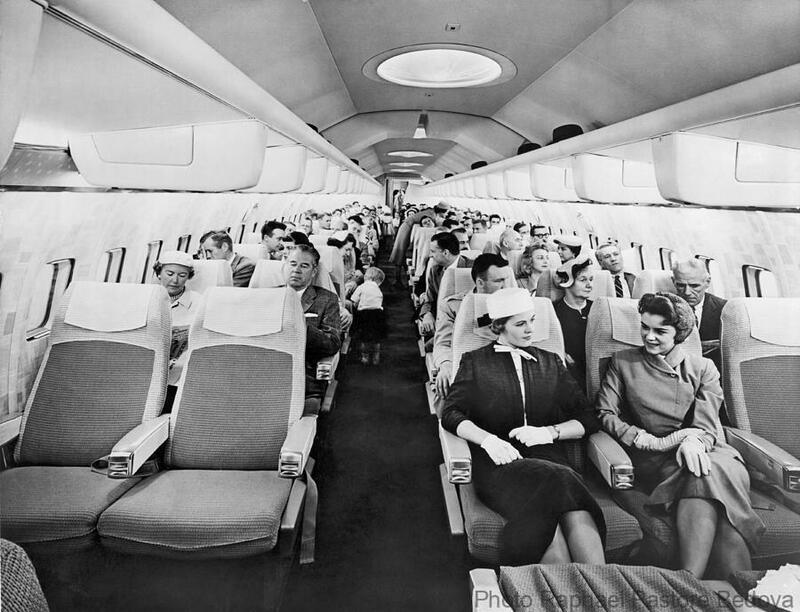 First class seating was often located at the rear of the plane. 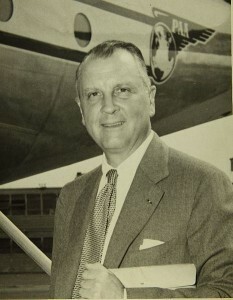 Pan American President Juan Trippe, the bad boy of the airline industry, clearly foresaw a wave of mass tourism fueled by a rising economy and jet aircraft. The new jet planes provided the formula for growth, increased capacity, lower cost, speed and an enhanced flying experience. A ruthless player, he positioned Pan Am to be the first to fly the 707, get a jump on the upcoming tourist revolution and extract the cream from his rival's business while they were losing their shirts with the slow outdated piston powered planes. 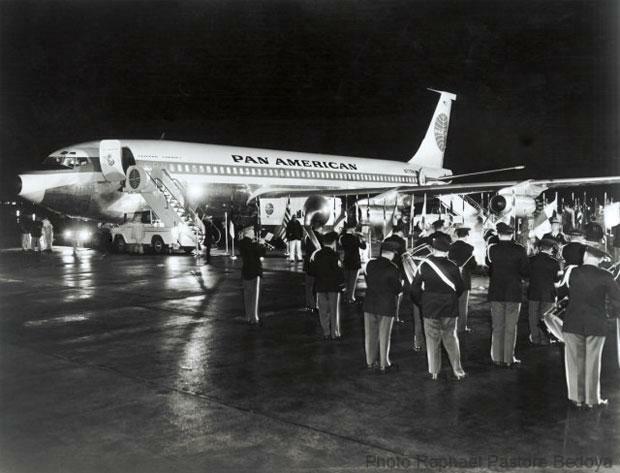 On October 15 1955. he stunned the airline world by announcing that Pan American had gone on a jet buying spree and contracted for 25 Douglas DC-8s and 20 Boeing 707s. The $269 Million order, the largest ever placed by a single airline. Airline executives could no longer afford to sit on the fence. They were headed for the jet age whether they wanted to go or not. Their propeller fleets were instantly out of date and value. 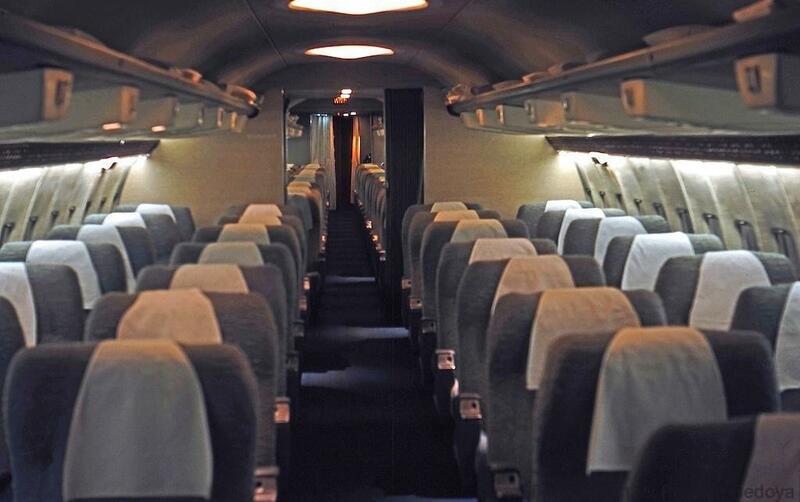 The Dash 80 was the prototype for the KC-135 Stratotanker and the 707 airliners. It was built in less than two years from project launch in 1952 to rollout on May 14, 1954. Its US$16 million cost was an enormous risk for the Boeing Company, which had no committed customers.